Step 4. 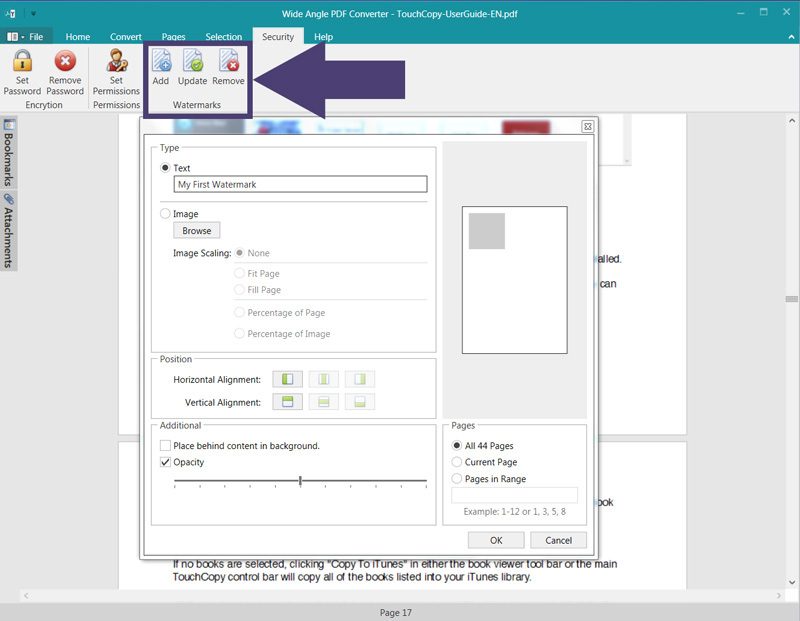 Click the "Add Watermarks" button under the Security tab in the PDF Converter toolbar. Step 5. Customize your watermark using the options provided. Step 6. Click OK, and save your file. A watermark is used on digital work to show the copyright owner of the content. PDF Converter allows you to easily add watermark to PDF documents. With a PDF open, click Add Watermarks from the security tab in the PDF Converter toolbar. Choose either a text watermark or an image watermark by clicking the relevant radio button. Then, either type your text or browse your image to use. Once you have defined your watermark's content, you can modify it using the options. Scale Image - Define how large your image watermark will be on your page. Position - Align your watermark horizontally and vertically. Additional - Place watermark in front or behind your content, and alter the opacity. Pages - Chose which pages you would like the watermark to appear on. Once you're happy with your settings, hit OK. You'll see that your watermark is now applied to your chosen pages. Save your file to save the watermark. To update or change a watermark, click Update Watermarks from the Security tab. This will bring up your watermark options again. When you've filled in the form and clicked OK, your new watermark settings will overwrite your previous watermarks. Removing watermarks from your document is as easy as clicking Remove Watermarks. You can chose to remove all watermarks, or watermarks from specific pages. Click OK, and your watermarks will be removed!